The new Vanquish has arrived-joining our ammamentarium of fat busting, body shaping and weight reduction treatment techniques already available at our centre. We are all so excited about it. Vanquish is a new revolutionary procedure in permanent fat reduction. It is a painless and surgery-free treatment that has no downtime. This new fat reduction machine is now available at our centre to help fulfill that wish in our clients. Vanquish uses a "focused-field radio frequency" to zap fat without ever touching the body. The treatment utilizes selective radio frequency to target the fat layers and permanently remove fat cells, giving dramatic results that can be seen in as little as a few weeks following the first treatment. During the four sessions spaced a week apart, you lie underneath an apparatus with adjustable panels that positioned around the areas of the body yo be treated but don't actually touch you. Sensors built into the device "read" your body fat and customize the amount of energy needed to be delivered during each 30-min treatment. Although Vanquish heats the skin up to 101degrees, and the underlying fat to 120degrees, you will say that "it just feels warm" like standing in front of a radiator. There can also be a few days of mild redness and swelling. You will be advised to drink plenty of water before and after the treatment to help eliminate the dead fat cells. 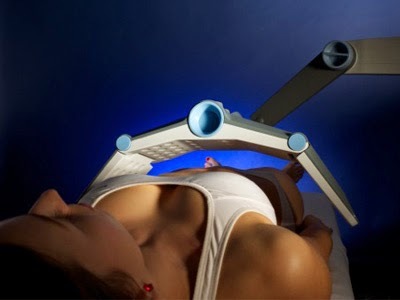 And because the device kills fat cells themselves, not just the fat within cells, the results should be long lasting. Are you a candidate for Vanquish? Our doctors and clinical therapists will meet you to assess and determine a treatment plan that will suit your individual needs. In general, if you have unwanted fats in the abdomen, flanks, back and thighs, and desires a treatment that is comfortable and painless, Vanquish is for you. Vanquish's unique design allows treatment of large areas at one time. This larger area helps to speed up treatment time and make treatments more convenient and simple for those looking to reduce fat bulges in front and back of the abdomen and buttocks. How is Vanquish compared to other Fat |reducing methods? Before this, we had cryolipolisis ( Coolsculpting) which kills fat by freezing them . The effect is very good with results as early as 6 weeks. But it's slow going, as only one body section can be treated at a time, so to reduce a waistline , you'd need to treat each love handle , and then the upper abdomen, in back-to-back one-hour sessions . As for chemical injections (Mesotherapy , Lipodissolve therapy) FDA approval is still pending, and side effects including pain and swelling are common. Tried my first Vanquish today. It was comfortable and totally painless. There is a feeling of warmth around the tummy (treated) area and the sides (flanks). My session was 30min as this was my first. The only discomfort for me was having to lie still flat on my back for straight 30min. Otherwise it was pretty good. Next session will be in 1 week's time. Let's see what happens this week.